Conventional crystalloids are fluids that contain a combination of water and electrolytes. They are divided into "balanced" salt solutions (e.g. Ringer's lactate) and hypotonic solutions. Either their electrolyte composition approximates that of plasma, or they have a total calculated osmolality that is similar to that of plasma. Normal saline (0.9%) is actually hypertonic with respect to sodium, and especially to chloride, if the osmolality is calculated. However, when normal saline is subjected to a freezing point depression test in an osmometer, its osmolality is approximately 285 mOsm/kg. The calculated value is derived by simple addition of its ionic constituents, whereas the measured value is affected by ionic association or dissociation. Sodium chloride has a relative osmolality of 1 compared with that of sodium and chloride, the value of which is 2. Other balanced electrolyte solutions are slightly hypotonic in vitro (265 mOsm/kg) in comparison with their calculated values and normal plasma. Solutions that contain less than the concentration of electrolytes found in Ringer's lactate solution are not often used intraoperatively. When an electrolyte-free solution such as D5W is administered, less than 10% stays intravascular. Approximately two-thirds are distributed to the intracellular space. Intravascular resuscitation is minimal, and cellular swelling occurs. The administered free water causes a decrease in the serum and interstitial electrolyte concentrations (dilutional effect) and may lead to symptomatic hyponatraemia. 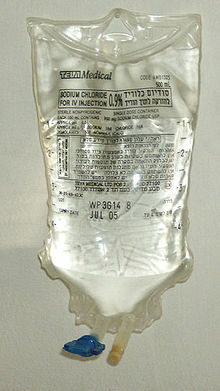 When solutions such as 0.2% or 0.45% saline are administered, similar, although slightly less pronounced, redistribution occurs. Therefore, a balanced salt solution with a sodium concentration of 130 mmol/L or more is normally chosen when major operative procedures are performed and when excessive blood loss is anticipated. More hypotonic solutions and D5W should be restricted to minor procedures and for some paediatric operations. Hypertonic saline solutions include 1.8%, 3%, 5%, 7.5% and 10% sodium chloride solutions. Other anions such as lactate and acetate may be incorporated. These are sometimes mixed with colloids such as dextran. Because the osmolality of hypertonic solutions exceeds that of intracellular water, and because sodium and chloride ions can not freely cross cell membranes, the extracellular fluid (ECF) becomes slightly hyperosmolar. A gradient for water to pass from the cells into the extravascular compartment is established, and the extracellular volume is expanded by approximately 2.5 L after administering 1 litre of 3% saline. Because electrolytes freely cross capillary membranes, the fluid is divided between the intravascular and extravascular compartments according to their relative volumes. Although hypertonic saline solutions increase the intravascular volume more than would the same volume of a balanced salt solution, they do so at the expense of a decreased intracellular volume. If large volumes of previously administered balanced electrolyte solutions have already increased intracellular volume, hypertonic saline is therapeutic. If not, cellular dehydration can result. The use of hypertonic saline solution has recently increased, due to increased use in intraoperative administration and trauma resuscitation. A major concern is hypernatraemia. However, hypernatraemic complications have not been reported in the clinical trials. Comprehensive reviews of many of the aspects of hypertonic saline have been published. Hyperchloraemic acidosis may occur owing to the large chloride load. However, substitution of hypertonic sodium acetate, although transiently improving acid-base parameters, has not been found to improve outcome and, curiously, increases lactaemia. This has a sodium concentration similar to that of the ECF. This limits the distribution of the fluid to the ECF. Within the ECF, the fluid is distributed between the interstitial fluid (ISF) (3/4) and the intravascular fluid (IVF) (1/4) in proportion to their contribution to ECF volume. “Although avoidance of preoperative intravascular optimization improves outcome, excessive fluid infusion leading to sodium, chloride and water overload is now becoming recognized as a major cause of postoperative morbidity and a contributory factor to length of stay, organ failure and mortality. Final SAQ: What fluids are available for the restoration of circulating volume in a patient suffering from acute blood loss? Discuss the advantages and disadvantages of each.